The Bahá'í Faith was born a Muslim sect amid 19th Century messianic fervor and social upheaval in Iran. Its roots are in Shi'ah Islam, but it has been reshaped into a pacifistic world religion based in Israel. Probably the most popular Bahá'í mantra is God is One; Mankind is One; Religion is One. This means that Bahá'ís are monotheists in the Judaic tradition, that mankind is meant to live in harmony, and that all religions are essentially the same. 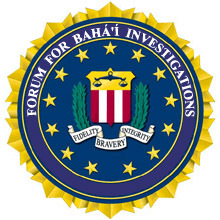 The Forum for Bahá'í Investigations is a forum for Bahá'ís in need of a more open-minded and tolerant approach to their faith. If you're wondering what kind of twisted misanthrope it takes to publish this stuff, you are welcome to read this apostate's narrative. Join us today! ... Or don't! This web site is one of many sites dedicated to alternative perspectives on the Bahá'í religion. You are welcome to view our old guestbook, or even email us! © The National Spiritual Assembly of the Covenant-breakers of Eastern Oregon and Tiajuana.